RIVER NORTH — Dozens of people packed a River North nightclub Tuesday night to hear the latest. Centrum Partners LLC made its first pitch to neighbors Tuesday on the development it wants to build at the southwest corner of Hubbard and Wells streets, a project that calls for an eight-story office building and 22-story, 193-unit apartment tower next door. The meeting was held Tuesday by Ald. Brendan Reilly (42nd) and the River North Residents Association at Paris Club, 59 W. Hubbard St.
Not every community development meeting is held at a club, but not every development site is like Centrum's latest. If any developer builds on the asphalt parking lots occupying the property, it will have to do so within the confines of neighboring loft buildings and a curve of the "L" tracks heading into the Merchandise Mart. "Suffice it to say, it was a very challenging site when we looked at it," Centrum Managing Partner John McLinden said. Chicago-based Centrum is attempting to answer that call by, like many of its River North neighbors, including room for fun. The apartment tower would be dog-friendly, and the office building would have a rooftop deck for white-collar workers to enjoy after hours. Centrum's plans also call for public art at the prominent River North corner, and street-level space for at least two new restaurants. 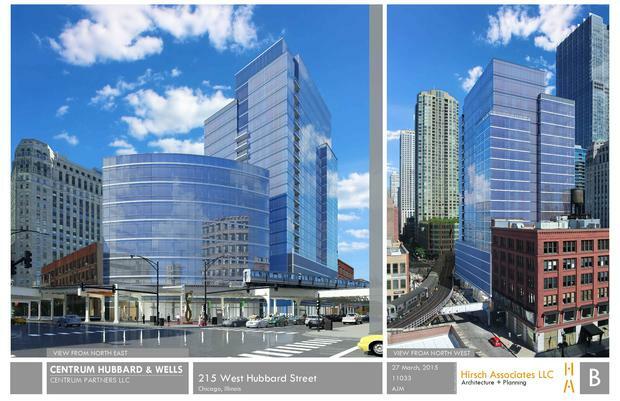 Designed by Chicago-based Hirsch Associates, the glassy towers, particularly the curving office tower abutting the "L," are meant to reflect the motion of the trains, Hirsch President Howard Hirsch said. McLinden said the project would contribute $1.4 million to the city's affordable housing fund, as well as nearly $1.2 million to an escrow fund the Chicago Transit Authority would use to improve lighting, among other things, underneath the nearby "L" tracks. Not many concerns were aired at Tuesday's meeting, but McLinden did say Centrum is looking at installing boards along the nearby "L" tracks that would absorb sound. The plan requires a zoning change, and Reilly declined to offer his thoughts on the proposal after the meeting. During the presentation, however, he did say that "we can do better than the existing" use of the property. "So let's look at this as a potential opportunity," he said.